Because of the loss of my Mother this past May, I have been reading a lot about getting through the holidays. I found this article and thought I would share it in case anyone else is experiencing a loss as well during this time. I hope it is helpful to you. Even during the best of times, the holidays can be exhausting and stressful. If you’re facing the holidays after the death of a loved one, celebrating may be the furthest thing from your mind. In fact, you may wonder if you’ll ever enjoy them again. However, by giving yourself permission to grieve, taking time for yourself and finding new ways to celebrate the holidays and the deceased, you can survive the holiday season. Regardless of when the loss occurred, the holidays can bring sadness to the surface and intensify your grief. While there is no way to avoid grief, there are steps you can take that can help you cope during the holiday season. You may experience sadness, anger or frustration, not only that the person who passed is gone, but that you are unable to enjoy the holidays as you have in the past. You may be angry that others are celebrating while you’re missing a loved one, or you may even feel numb and simply go through the motions, especially if this is your first holiday without the deceased. Your grief may even change over time, depending on the circumstances. For example, intense feelings of sadness over the loss of your mother may reappear when you celebrate your first holiday season with your child, as you wish for your mother’s love and support. Whatever your emotions, embrace them. Allowing yourself to feel them is the best way to move past them. In the past, perhaps you held a lavish party to ring in the New Year. Following the loss of a someone close to you, you may not have the desire or energy to do all this. It’s okay to take a step back and allow somebody else to host the party, or to make it a much smaller affair with close family and friends. Reminisce about the good times and old memories with family and friends. Pull out pictures from holidays past. Share your sadness with those who were also close to the person who passed. Start small on your road toward embracing the holidays by celebrating small moments of happiness. Savor a cup of warm apple cider. Sit back and watch the smile on a child’s face as they delight in family traditions. Purchase a special ornament for the tree in memory or continue to make her favorite dish for Hannukah. Have a mass said in memory. If you donate to an organization that recognizes the contribution publicly in some way, write “In memory of” and include the deceased’s name. Volunteer your time or resources to help others in a way that relates to the person you lost. If your mother died after a lengthy hospital stay, have her favorite flowers delivered to the ward for the other patients to enjoy. If you lost a child, donate gifts to your local synagogue or church to distribute to children who otherwise may not receive Hanukkah or Christmas gifts. Bring warm clothing or blankets to a Kwanzaa unity celebration to be distributed to those in need. Though they may seem like small things, they can help you feel connected to the person who has passed during the holidays. If Grandma bought all the grandchildren matching pajamas to wear during the holidays, continue the tradition by taking over and buying pajamas for your nieces and nephews. Serve meals at a homeless shelter or soup kitchen rather than prepare a lavish meal. Taking over old traditions maintains a link to the deceased, and creating new ones helps to remind you that life goes on. Avoid the temptation to drown your grief in excessive alcohol consumption or the use of prescription drugs like sleeping aids. This may only increase your feelings of sadness and minimize your ability to work through your grief. This is especially true for women, who tend to put their needs last. Be sure to eat healthy meals and get the rest you need. Allow yourself to feel whatever emotions the holidays elicit. Say no to invitations that you don’t have the emotional or physical energy to deal with. There is no right or wrong way to deal with your grief. Handle the holidays the best you can. If you choose not to participate in a particular service or outing due to your grief, do not judge or be critical of yourself. Some people wish to share their emotions with others who are experiencing a similar loss. There are a variety of online and in-person supports for people experiencing grief during the holidays due to the loss of a family member or friend. Surviving the Holidays offers articles, videos and tips on coping with grief during the holiday season. You can search for a Surviving the Holidays in your area, as well as sign up to receive daily, encouraging e-mails to help you deal with your grief. Check your local church for grief programs specific to the holidays. Many churches offer grief support groups during the holiday seasons. 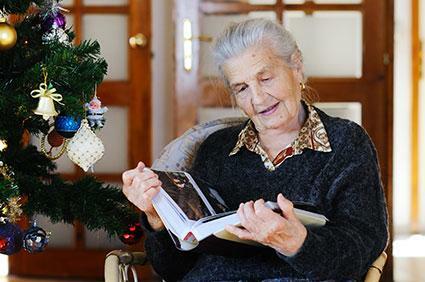 Hospice programs may also offer holiday specific grief support. Pathways, a hospice program in Northern California’s Bay Area, offers grief support groups called Pathways Through the Holidays. General grief support groups are also a good source to turn – even if the event is not grief specific, many participants will be experiencing the same emotions as the holidays approach. It is often helpful to read books written by others who have not only survived the holidays after someone has passed, but gone on to embrace them and enjoy celebrations once again. The Empty Chair: Handling Grief on Holidays and Special Occasions by Susan J. Zonnebelt-Smeenge and Rober C. De Vries combines emotional support, spiritual guidance, and personal experience – the authors each lost a spouse – to help readers learn how to honor their loved one during the holidays. Thoughts for the Holidays: Finding Permission to Grieve by Doug Manning helps readers discover their own way to cope and survive the holiday season, while at the same time remembering the deceased. Healing Your Holiday Grief: 100 Practical Ideas for Blending Mourning and Celebration During the Holiday Season by Alan D. Wolfelt offers ideas on honoring those who have passed during the holidays while helping readers understand the complex emotions surrounding grief and the holidays. How Will I Get Through the Holidays? 12 Ideas for Those Whose Loved One Has Died by James E. Miller helps readers understand their grief and what to expect during the holidays. It also provides thoughtful quotations on grieving. Your grief over the loss of you family member or friend will never completely disappear. Grief is a process that ebbs and flows. However, by allowing yourself to grieve honestly, rather than bottling your emotions up, there will come a time when you will embrace the holidays again.